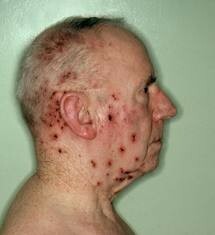 Shingles: The Other Silent Killer!! Herpes Zoster is no joking matter. This disease is curable, but if let unchecked it can lead to fatal complications. If you notice any symptoms, don't put it off like tomorrow's homework. Early detection within four to five weeks of the symptoms listed below can lead to a speedy recovery. If treated properly and quickly recovery can take as little as one to two weeks. 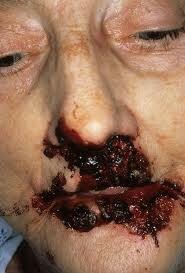 Failure to treat this disease can leave you looking and feeling like a zombie!! as seen below. Red patches of skin can form, followed by blistering. Blisters can break then forming sores. Typically the rash occurs on your spine, chest, and belly but, may include your face, eyes, ears, and mouth.